The works of the English writer Graham Greene explore issues of right and wrong in modern society, and often feature exotic settings in different parts of the world. 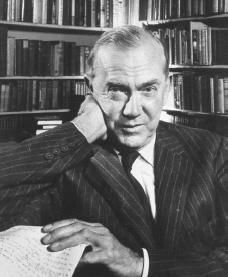 Graham Greene was born on October 2, 1904, in Berkhamsted, Hertfordshire, in England. He was one of six children born to Charles Henry Greene, headmaster of Berkhamsted School, and Marion R. Greene, whose first cousin was the famed writer Robert Louis Stevenson (1850–1894). He did not enjoy his childhood, and often skipped classes in order to avoid the constant bullying by his fellow classmates. At one point Greene even ran away from home. him to London for psychotherapy (the treatment of a mentally or emotionally disturbed person through verbal communication) by a student of the famous Sigmund Freud (1856–1939). While he was living there, Greene developed his love for literature and began to write poetry. Writers Ezra Pound (1885–1972) and Gertrude Stein (1874–1946) became lifelong mentors (teachers) to him before he returned to high school. After graduating in 1922, Greene went on to Oxford University's Balliol College. There, Greene amused himself with travel as well as spending six weeks as a member of the Communist Party, a political party that supports communism, a system of government in which the goods and services of a country are owned and distributed by the government. Though he quickly abandoned his Communist beliefs, Greene later wrote sympathetic profiles of Communist leaders Fidel Castro (1926–) and Ho Chi Minh (1890–1969). Despite all these efforts to distract himself from his studies, he graduated from Oxford in 1925 with a second-class pass in history, and a poorly received volume of poetry with the title Babbling April. In 1926 he began his professional writing career as an unpaid apprentice (working in order to learn a trade) for the Nottingham Journal, moving on later to the London Times. The experience was a positive one for him, and he held his position as an assistant editor until the publication of his first novel, The Man Within (1929). Here he began to develop the characteristic themes he later pursued so effectively: betrayal, pursuit, and death. His next works, Name of Action (1931) and Rumour at Nightfall (1931), were not well received by critics, but Greene regained their respect with the first book he classed as an entertainment piece. Called Stamboul Train in England, it was published in 1932 in the United States as Orient Express. The story revolves around a group of travellers on a train, the Orient Express, a mysterious setting that allowed the author to develop his strange characters with drama and suspense. Twelve years after Greene converted from Anglicanism to Roman Catholicism, he published Brighton Rock (1938), a novel with a highly dramatic and suspenseful plot full of sexual and violent imagery that explored the interplay between abnormal behavior and morality, the quality of good conduct. The Confidential Agent was published in 1939, as was the work The Lawless Roads, a journal of Greene's travels in Mexico in 1938. Here he had seen widespread persecution (poor treatment) of Catholic priests, which he documented in his journal along with a description of a drunken priest's execution (public killing). The incident made such an impression upon him that this victim became the hero of The Power and the Glory, the novel Greene considers to be his best. During the years of World War II (1939–45: when Germany, Italy, and Japan fought against France, the United Kingdom, the Soviet Union, and the United States [from 1941 until the end of the war]) Greene slipped out of England and went to West Africa as a secret intelligence (gathering secret information) officer for the British government. The result, a novel called The Heart of the Matter, appeared in 1948, and was well received by American readers. Steadily, Greene produced a series of works that received both praise and criticism. He was considered for the Nobel Prize for Literature but never won the award. Still, many other honors were given to him, including the Companion of Honor award by Queen Elizabeth in 1966, and the Order of Merit, a much higher honor, in 1986. In 1990 Greene was stricken with an unspecified blood disease, which weakened him so much that he moved from his home in Antibes, the South of France, to Vevey, Switzerland, to be closer to his daughter. He lingered until the beginning of spring, then died on April 3, 1991, in La Povidence Hospital in Vevey, Switzerland. Greene, Graham. Graham Greene: Man of Paradox. Edited by A. F. Cassis. Chicago: Loyola University Press, 1994. Shelden, Michael. Graham Greene: The Enemy Within. New York: Random House, 1994. Sherry, Norman. The Life of Graham Greene. New York: Viking, 1989.